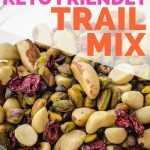 This simple and easy keto friendly trail mix recipe is a perfect grab and go low carb snack! 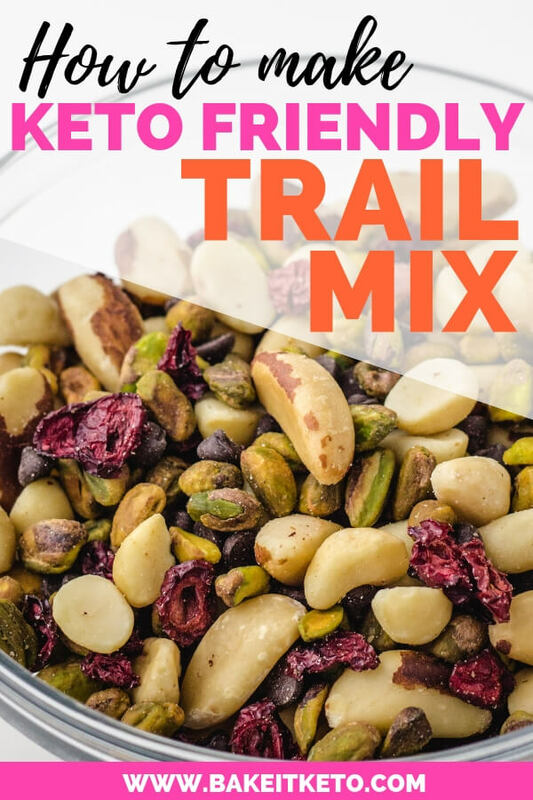 Sure, you could make low carb trail mix without any chocolate but what fun would that be? For this keto trail mix we’re using Lily’s Sugar-Free Chocolate Chips. Lily’s chips are sweetened with erythritol, stevia, and inulin, which are all keto friendly sweeteners. As a Type 1 (autoimmune) Diabetic, these sweeteners don’t personally affect my blood sugar. I buy this 4-pack of Lily’s chips on Amazon. Alternatively, you could substitute unsweetened chocolate chunks. Can You Have Dried Fruit On The Keto Diet? The tangy flavor of dried fruit in trail mix is a fantastic contrast to the buttery, crunchy nuts and the sweet chocolate chips. But is there any keto friendly dried fruit? While fresh cranberries are low carb, dried cranberries usually contain a ton of added sweetener. Even those labeled “no added sugar” are typically heavily sweetened with apple juice. I love Honestly Cranberry’s dried cranberries because they’re truly unsweetened! Click here to buy the same ones I use on Amazon. Have you heard that you may need to take in additional electrolytes while eating keto? I know that I personally feel my best when I do. 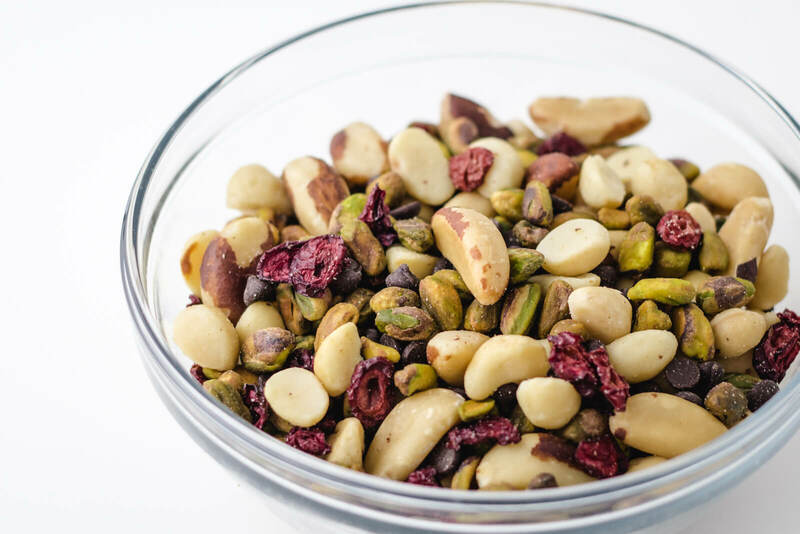 In this mix, I’ve included brazil nuts because they’re a good source of magnesium and potassium, and pistachios because they’re a good source of potassium. I’ve rounded out the nut mix with macadamias for their delicious, buttery flavor and because they’re one of the lowest carb nuts. You can certainly feel free to substitute your favorite nuts or use what you already have in your pantry. Click here to view the California Almond Board’s handy chart comparing the macro- and micronutrient content of common tree nuts. 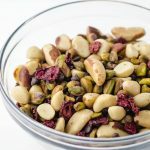 I always use roasted or sprouted and salted nuts because I like the flavor better, but you could use raw nuts if you prefer them. It’s not always possible to find roasted or sprouted and salted nuts at my local grocery store. If you have the same problem, it’s very easy to roast your own nuts. First, preheat the oven to 350 degrees F. Line a cookie sheet with foil or parchment paper and pour the nuts onto the pan. Drizzle the nuts with 1-2 teaspoons of oil and toss to coat (I like to use avocado or macadamia oil). Spread the nuts in an even layer and season with sea salt. Toast the nuts for 10-12 minutes, stirring halfway through and being careful not to burn them. Add the nuts, chocolate, and cranberries to a medium bowl and mix to combine. Store in an airtight container. I like to portion out the trail mix into individual baggies or containers right after I make it, so it is easy to grab and go.